What is the best AWS online training available today? That’s exactly what we will attempt to answer now. We have brought together 5 top rated courses to give you the most comprehensive, unbiased review round up available. Covering various price ranges and learning format (from scheduled live tutor led instruction to self-paced video based training) we will help you find the best option for you. For our findings at a glance, just head to the table below. For an in depth review of each of our selected AWS training courses, plus a detailed analysis of what you can expect from your online training, keep on reading. What is the best way to learn AWS? AWS certification trainings are known for their thoroughness, consistency, rigor, appropriateness in molding a skilled cloud architect, developer, and cloud engineer. AWS offers 3 tracks of AWS certifications, the AWS Architecting track, AWS Developing track, and the AWS Operations track. In the Architecting track, there are 2 levels of certification; the Associate AWS Certified Solutions Architect, and one who has achieved this certification can then learn more and progress to become a Professional AWS Certified Solutions Architect. In the Developing track, one becomes an Associate AWS Certified Developer; while in the Operations track, one becomes an Associate AWS Certified SysOps Administrator. Both the Associate AWS Certified Developer and Associate AWS Certified SysOps Administrator can be trained further, and each can become a Professional AWS Certified DevOps Engineer, which is equivalent to a skilled Cloud Engineer. The purpose of this article is to focus on the Architecting track. Any learning institution that offers such training, should provide the following. How to develop and deploy high-scalable fault-tolerant AWS system that support a website that does not go off or experience connection outages. How to migrate an on-premise application (that is business data from a server) into an AWS system. How to ingress or egress data to, or from, an AWS system. How to select the most appropriate AWS services based on security, data, database, and compute requirements. Learn to identify and use the best cloud architectural practices with an AWS system. How to estimate the AWS overall cost, as well as identify the best cost control mechanisms. The answer is online training as one is taught the most up-to-date subject matter, alongside skills, using the best training standards available. There are various institutions that offer AWS certification training online. With the increasing popularity of these courses, students from all over the world are able to become fully certified. India is one such nation where the take-up rate of online AWS courses has been very high. If you’re looking for the best AWS training in Hyderabad, Bangalore or Chennai for instance, each one of the courses listed below is definitely worth considering. With that being said, wherever you are based, one is advised to do their research in order to choose the institution that offers the best AWS certification training available. There are various institutions that offer AWS certifications online. These training institutions can be rated based on their curriculum and overall training quality. To help you in your research we have selected 5 top rated courses to give you detailed information on the offered curriculum, as well as the pros and cons of each, so that you can choose the right course for you. This is a thorough, rigorous, and fact-based practically-oriented online AWS certification training that uses a high-quality and practical curriculum to teach the learner the basics of cloud computing as well as train him/her to become a competent and skilled AWS solutions architect. This course trains the learner to expertly manage cloud computing which allows one to build the most fitting cloud infrastructure solutions on an AWS platform. This skills are gained from knowledge acquired during hands-on, in-depth tutorial sessions where the student is meticulously taught till (s)he understands how a cloud computing architecture is designed, and how it is optimized to create an infrastructure solution. This course is designed and offered by Collabera-TACT (Technology-Academy for Competency Training), a subsidiary of Collabera. This institution offers one of the most highly-valued AWS Certification. This course offers 35hours of live instructor-led online training, which includes live demos, live practical lessons, and in-tutorial assignments. These instructor-led tutorials are designed to be live and interactive sessions which allows the learner to directly interact with an expert instructor. There is also an expert technical team that provides 24hours query resolution support during any day of the week. This means that question that the learner has is answered at any time. Moreover, even after one completes the training, one is still able to use his/her lifetime access to the Learning Management System (LMS) of Collabera-TACT to access key course information from anywhere in the world. Additionally, upon completion of this AWS training course, one is awarded an appropriate AWS Certification. The main prerequisite for enrolling into this AWS course is that one must have basic computer knowledge. Nevertheless, an understanding of basic Linux concepts is an added advantage, but not necessarily mandatory as the tutor will cover this during the introductory lessons. The main objectives of this cloud computing and AWS course are stated hereafter. To begin with, the course is designed to give the leaner a clear understanding of AWS building blocks. Secondly, this course allows the learner to learn about CloudFormation templates, and how to work with storage and compute resources such as EC2, Elastic Block Store(EBS), Virtual Private Cloud(VPC), S3, and Glacier. Thirdly, the course enables the learner to learn about CloudFront Distributions, and how to work with Networking and AWS Scale services such as Auto Scale, Elastic Load Balancing(ELB), Amazon Route 53, VPC, and CloudWatch metrics and alarms. Also, the course allows the participant to build a scalable, highly-available, and powerful fault-tolerant Web Application Service. Likewise, the course is designed to give the learner an in-depth understanding of AWS billing and how to save costs. Besides, the learner gains an in-depth knowledge of the different IaaS architectural design patterns. Most importantly, the course gives the learner hands-on practice on how to use and run major AWS components. The course curriculum is natively-developed, that is, it is designed by Collabera-TACT based on its experience of teaching AWS for over a decade. This curriculum reflects the above-stated course objectives. A run down of this curriculum is provided below. The curriculum starts with cloud computing (CC) lessons. The first lesson is introduction to CC, and is followed by CC types and thereafter is a lesson about cloud computing issues. Afterwards, there is a lesson on virtualization. Then the course moves into AWS. The introduction to AWS lesson covers the benefits of AWS along with the global distribution of its data centers. It also covers how one goes about choosing the right geographic region and availability zone so that the web services can be accessed on-demand with low latency (that is, waiting time). Security and Identity (which include IAM[Identity and Access Management] and Key Management Service[KMS]). The above training modules are followed by comprehensive lessons in EC2 instances. An instance is simply a type of EC2 virtual cluster. Here one is taught how to choose the right instance types and EC2 purchasing options. Afterwards, there are lessons that cover some of the AWS resources in depth. These lessons are as follows (arranged sequentially); EBS, CloudWatch, SNS, Auto Scaling, IAM, Elastic Beanstalk, S3, Glacier, RDS, CloudFormation, CloudFront, VPC and DynamoDB lessons. Afterwards, the learner participates in an AWS project, and is expected to complete 3 tasks. Thereafter, there are 3 POC (Proof of Concept) assignments, with each assignment having anywhere between 3 to 10 tasks. After completing these tasks, one is ready to take an online exam, and if the learner this exam, then (s)he earns a certification. The entire course duration is 40hours. Learner gains in-depth knowledge about cloud computing. 35hours of live instructor-led online training. Enables learner to develop and deploy a high-scalable, fault-tolerant and highly available AWS system. Learner knows how to properly migrate an on-premise application to an AWS system. One knows how to ingress or egress data to, or from, an AWS system. One is skilled on how to select the most appropriate AWS services based on security, data, database, and compute requirements. One gains an in-depth knowledge concerning the best AWS-cloud architectural practices. One knows how to estimate the (AWS) overall cost, as well as identify the best cost control mechanisms. Lifetime access to Collabera-TACT LMS. Offers a recognized AWS certification. Some of the theoretical concepts may be quite abstract, hence once must stay totally focused during the theory-concentrated lessons. The Collabera Tact Cloud Computing and AWS Training is a thorough, rigorous, and practically-oriented online AWS certification training that uses a high-quality practical curriculum to teach the learner the basics of cloud computing as well as train him/her to become a competent and skilled AWS solutions architect. The superb curriculum and high training quality makes Collabera Tact Cloud Computing and AWS Training the best AWS online training currently available. This is a thorough, rigorous, and practically-oriented AWS online training course that is designed to give the learner the requisite knowledge and skills to pass an AWS CSA (Certified Solutions Architect) – Associate Exam. This course places particular emphasis on Lambda, EC2, S3, VPC, IAM, Redshift, Glacier, EBS, Snowball, Cloudfront, SNS, Cloudwatch, SES, and DynamoDB. 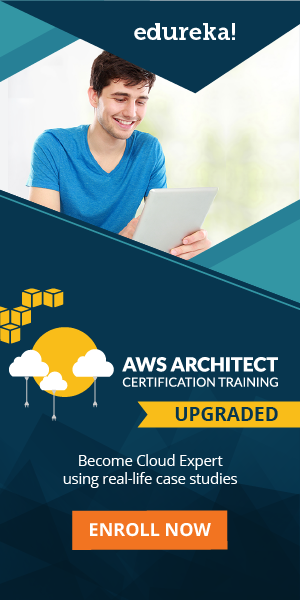 This course uses a practical curriculum to teach the learner the basics of cloud computing as well as train him/her to become a competent and skilled AWS solutions architect. This course is designed and offered by Edureka, a subsidiary of Brain4ce Education Solutions Limited. This institution offers a highly valued AWS Certification, (as well as other AWS based courses). This AWS Architect course offers 30hours of live instructor-led online training, which includes live demos, live practical lessons, and in-tutorial assignments. These instructor-led tutorials are designed to be live and interactive sessions which allows the learner to directly interact with an expert instructor. There is also an expert technical team that provides 24hours query resolution support during any day of the week. This means that question that the learner has is answered at any time. Moreover, one gains a lifetime access to the LMS of Edureka. Additionally, upon completion of this AWS training course, one is awarded an AWS CSA Certification. The main prerequisite for enrolling into this AWS course is that one must have basic computer knowledge. Also an understanding of basic Linux concepts is an added advantage. The main objectives of this cloud computing and AWS course are stated hereafter. To begin with, the course is designed to give the leaner a clear understanding of AWS building blocks. Secondly, this course allows the learner to learn about CloudFormation templates, and how to work with storage and compute resources such as EC2, EBS, VPC, S3, and Glacier. Thirdly, the course enables the learner to learn about CloudFront Distributions, and how to work with Networking and AWS Scale services such as Auto Scale, ELB, Amazon Route 53, VPC, and CloudWatch metrics and alarms. The course curriculum is natively-developed by Edureka based on its experience of teaching AWS. This curriculum reflects the above-stated course objectives. A run down of this curriculum is provided below. The curriculum starts with introduction to AWS lesson that covers the benefits of AWS along with the global distribution of its data centers. It also covers the basics of cloud computing. Application Services (SES, SNS and SQS), and Security and Identity (which include IAM and KMS). This is followed by lessons in Amazon EC2. Afterwards, there is a lesson on Storage services and how to use the AWS command-line interface (CLI). VPC, Direct Connect, RDS, DynamoDB, ElastiCache, RedShift, ELB, Auto Scaling, Route53, Management Tools, Lambda, Elastic BeanStalk, OpsWork, and Security and Identity tools. Afterwards, the learner participates in an AWS project that is based on a real-life case-study. One is then expected to complete several tasks and POC assignments. After completing these tasks, one is ready to take an online exam; and if one passes it, then (s)he earns a CSA certification. Offers introductory lessons on cloud computing. One knows how to ingress and egress data into and out of an AWS system. Lifetime access to Edureka LMS. 30hours of live instructor-led online training. Offers a recognized AWS CSA certification. The Edureka AWS Architect Certification Training (ACT) is a thorough, rigorous, and practically-oriented AWS online training course that is designed to give the learner the requisite knowledge and skills to pass an AWS CSA – Associate Exam. This is a thorough, rigorous, and practically-oriented AWS online training course that is designed to give the learner the requisite knowledge and skills to pass an AWS CSA – Associate Exam. It places emphasis on the Cloud Infrastructure, Lambda, EC2, S3, IAM, Redshift, and CloudTrail. It also focuses on Big Data analytics using Amazon EMR (Elastic MapReduce). This course is designed and offered by Intellipaat. This institution offers a highly valued AWS Certification. This course offers 32hours of live instructor-led online training, which includes live demos, live practical lessons, and in-tutorial assignments. These instructor-led tutorials are designed to be live and interactive sessions which allows the learner to directly interact with an expert instructor. There are also 26hours of self-paced videos. There is also an expert technical team that provides 24hours query resolution support during any day of the week. This means that question that the learner has is answered at any time. Moreover, one gains a lifetime access to the LMS of Intellipaat. Additionally, upon completion of this AWS training course, one is awarded an AWS CSA Certification. The course curriculum is natively-developed by Intellipaat based on its experience of teaching AWS. This curriculum reflects the above-stated course objectives. A run down of this curriculum is provided below. The above modules are followed by lessons in Amazon EC2. One is the taught how to setup and run a VPC. Afterwards, there is a lesson on Storage services. This is followed by IAM lessons. After that, there are lessons covering Database services. Next are lessons on auto-scaling and load-balancing. Then follows Route53 lessons. Subsequently, there are lessons covering Application services. Finally, there are lessons on Analytics and Big Data, with emphasis placed on EMR. Offers lessons on cloud computing. Learner knows how to use EMR for Big Data analytics. Lifetime access to Intellipaat LMS. 32hours of live instructor-led online training. The Intellipaat AWS Solutions ACT is a thorough, rigorous, and practically-oriented AWS online training course that is designed to give the learner the requisite knowledge and skills to pass an AWS CSA – Associate Exam. It places emphasis on the Cloud Infrastructure, Lambda, EC2, S3, IAM, Redshift, and CloudTrail, as well as how to perform Big Data analytics using Amazon EMR. This is a thorough, rigorous, and practically-oriented AWS online training course that uses 6hours 53minutes of training videos to impart the learner with the requisite knowledge and skills to pass an AWS CSA–Associate (CSAA) Exam. It focuses on AWS essential services, and also offers practice tests. This course uses a practical course schedule to teach the learner the basics of cloud computing as well as train him/her to become a skilled AWS solutions architect. This course trains the learner to expertly manage cloud computing which allows one to build the most fitting cloud infrastructure solutions on an AWS platform. This course is designed and offered by WhizLabs. It prepares one to take a CSAA exam, it does not give out this exam. This course offers training videos that last 413minutes. These videos include live demos and live practical lessons. There is also an expert technical team that provides query resolution support. Moreover, upon completion of this AWS training course, one is well-prepared to take an AWS CSAA Certification exam. The main prerequisite for studying this AWS course is that one must have basic computer knowledge. Also an understanding of basic Linux concepts is an added advantage. Likewise, one must have an internet-connected computer and an AWS account. The main objectives of this cloud computing and AWS course are stated hereafter. To begin with, the course is designed to give the leaner a clear understanding of AWS building blocks. Secondly, this course allows the learner to learn about CloudFormation templates, and how to work with storage and compute resources. Thirdly, the course enables the learner to learn about CloudFront Distributions, and how to work with Networking and AWS Scale services. Also, the course allows the participant to build a scalable, highly-available, and powerful fault-tolerant Web Application Service. Besides this, the learner gains an in-depth knowledge of the different IaaS architectural design patterns. Most importantly, the course gives the learner hands-on practice on how to use and run major AWS components. The course curriculum is natively-developed by WhizLabs. The curriculum schedule reflects the above-stated course objectives. A run down of this curriculum is provided below. This is followed by lessons in Amazon EC2. Then, there is a lesson on Storage services. After that, there are lessons covering Database services, auto-scaling and load-balancing. Then follows Route53 lessons. Subsequently, there are lessons covering Application services. Afterwards, the learner can attempt to complete a AWS project. After that, one is ready to take an online exam; and if one passes it, then (s)he earns a CSA certification. Course limited to only 413minutes. The WhizLabs AWS CSAA Course is a thorough, rigorous, and practically-oriented AWS online training course that uses 6hours 53minutes of training videos to impart the learner with the requisite knowledge and skills to pass an AWS CSAA exam. It focuses on AWS essential services, and also offers practice tests. This is a thorough, rigorous, and practically-oriented AWS online training course that uses 22.5hours of on-demand training videos and 17 supplemental resources to impart the learner with the requisite knowledge and skills to pass an AWS CSAA exam. This course is designed and offered by Ryan Kroonenburg, and is hosted in the Udemy platform. It prepares one to take a CSAA exam, it does not give out this exam. This course offers 22.5hours worth of training videos. These videos include live demos and live practical lessons. Secondly, this course allows the learner to learn about CloudFormation templates, and how to work with storage and compute resources. Likewise, the course is designed to give the learner an in-depth understanding of AWS billing and how to save costs. Besides, the learner gains an in-depth knowledge of the different IaaS architectural design patterns. Most importantly, the course gives the learner hands-on practice on how to use and run major AWS components. The course curriculum is natively-developed by Ryan Kroonenburg. The curriculum schedule reflects the above-stated course objectives. A run down of this curriculum is provided below. Also, the learner is familiarized with the core resource groupings as covered in the above training courses. Uses 22.5hours of online on-demand training videos. The Udemy CSAA Online Course is a thorough, rigorous, and practically-oriented AWS online training course that uses 22.5hours of on-demand training videos and 17 supplemental resources to impart the learner with the requisite knowledge and skills to pass an AWS CSAA exam. It focuses on AWS essential services, and also offers practice tests. Amazon Web Services (abbreviated as AWS) is an Infrastructure-as-a-Service (IaaS) portal that offers secure, on-demand cloud services to clients on a subscription basis. This broad infrastructure platform offers an optional set of cloud services with the clients choosing the services that best fits their enterprise or individual needs so that they can build their own cloud infrastructure to power their websites. This subscription-based service uses pay-as-you-go pricing model that comes with a 12months free-tier options, which allows a user to have a fully functional virtual cluster available at all times. Among the cloud services provided are storage options, computing power, databases, content delivery options, and networking. AWS is owned by Amazon.com, Inc – the largest e-commerce company headquartered in Seattle city in Washington. Amazon.com launched AWS in 2006 as its sole provider of decentralized cloud computing services. Because AWS is based on a cloud computing platform, it is important to understand what cloud computing is. Cloud computing is a collective term that describes an IT (information technology) model/paradigm that is designed to give its users an ubiquitous (that is, ever-present) access to a remote pool of shared configurable resources, primarily computing resources such as remote servers, storage, and computer networks, along with remote web-based services and applications. These shared configurable resources are collectively called the Cloud. Cloud computing requires an Internet connection for one to configure and manage the selected set of cloud resources so as to ensure that data-transmission and data-access mechanisms are ultra-efficient and reliable so that one achieves computing coherence which optimizes the economies of scale. The main providers of cloud computing services are Amazon Web Services, Windows Azure, Google, OpenStack, Digital Ocean, Liquid Web, and VMWare. Cloud computing uses a service-oriented architecture which requires that every resource is offered as-a-service(abbreviated as XaaS, EaaS, or simply aaS). These cloud resourcing are offered using different models of XaaS with the main ones being SECaaS, MBaaS, PaaS, StaaS, and Iaas. SaaS stands for Software-as-a-Service and includes OpenStack, Google Docs and Microsoft Office Online. PaaS stands for Platform-as-a-Service such as Amazon EC2. StaaS is Storage-as-a-Service and includes Digital Ocean, Amazon S3 and Carbonite. SECaaS is Security-as-a-Service and it includes services such as security event management, anti-malware/antivirus provison, intrusion detection, and authentication services. MBaaS is Mobile-Backend-as-a-Service and it includes programming interfaces for mobile apps and web apps. Also, virtual private servers(VPSs), such as those offered by Vmware and Liquid Web, can be incorporated in the cloud. Finally, IaaS encompasses provision of all XaaS available in the cloud including SECaaS, MBaaS, PaaS, StaaS, and VPS. The cloud is usually housed in data centers which ensure that the computer systems are connected to a telecommunication network, data storage systems, backup power supplies, and security devices, with these centers being subjected to environmental controls such as air conditioning and fire suppression. AWS uses serverless cloud computing as the virtual servers are managed remotely with the bills only factoring in the amount of resources used in these virtual machines. AWS data centers house powerful computers that host the remote computing services (also called web services) that make up its cloud computing platform. Also, there are computer hardware that can be rented out to clients as virtual computers. The virtual computers offered by AWS allow the client to configure their hardware resources such as processing units (CPUs and GPUs), RAM capacity, hard-disk type (solid-state disks[SSDs] or hard disks). The amount of storage capacity, and choice of operating system as well as pre-loaded application programs such as database or web-server management tools. Likewise, the input and output (I/O) components such as monitor (for display), mouse and keyboard are virtualized into an I/O console. This virtualization allows a client to use any updated browser in the physical machine to login into the virtual computer, and then use the virtual computer to manage his/her AWS virtual cluster. Therefore, if one has a physical computer with low hardware ratings, for example, Pentium IV CPU, less than 1GB of RAM, and 80GB hard disk, which cannot run the virtual clusters on its own due to its limited hardware resources; then one need only use the computer to launch a browser which allows one to access a much powerful virtual computer that is used to manage the cluster. The virtual computer and virtual cluster make up the AWS system. The AWS system can be deployed using either of 2 deployment models; as a public cloud or as a hybrid cloud. To understand these deployment models, one needs to know what a private cloud is. A private cloud is a cloud infrastructure that is operated by a single entity from self-run data centers. In a public cloud, a cloud services vendor such as AWS owns the data centers, and offers cloud services alongside cloud infrastructure to different users. However, in an AWS system that is deployed as a public cloud, the cloud infrastructure is accessible to a public audience who can connect to it via a trusted internet connection. For instance, ShipStation – public e-commerce website – allow different retailers to create an account which allows them to post their products that are then displayed by the website. Here, the public can create data and then transmit it to the AWS system which then displays it. On the other hand, the hybrid deployment model involves connecting a private cloud to the AWS system. The cloud architecture of the AWS system is its systems architecture which allows the different cloud components to communicate with one another using a coupling mechanism, including a messaging queue, so as to optimize the delivery (and operation) of cloud computing. Therefore, after one selects the required cloud resources, (s)he must then build the cloud architecture to appropriately connect these resources. It is for this reason that one needs to be trained as an AWS architect. Still, why is learning AWS important? The answer is that AWS is becoming popular in the business world as enterprises adopt cloud solutions for their business needs. In the IaaS cloud computing market, AWS dominates the market, and thus those who know how to operate AWS systems are at an advantage as currently employment opportunities outstrip the trained workforce. AWS has increased the number of clouding resources on offer since its inception, and by 2016, there were over 70 services offered. These services can be accessed over HTTP (Hypertext Transfer Protocol) using the SOAP (Simple Object Access Protocol) protocol and the REST (Representational State Transfer) architectural style. These resources cover a wide range of web modules including networking, computing, storage, database, deployment, application services, developer tools, management, mobile, analytics, and IoT (Internet of Things) tools. The 2 main popular resources are a CaaS (Compute-as-a-Service) resource, the Amazon EC2(Elastic Compute Cloud), and a StaaS resource, the Amazon S3(Simple Storage Service). AWS has gained a competitive advantage over its business rivals due to 3 main reasons; broad range of services, provision of high-quality and reliable services, and availability of many data centers. This is precisely why it is so important to learn the relevant infrastructure. Careers in the field are not location dependent either. AWS houses its data centers in server farms that are distributed across the globe. AWS has mapped these server farms locations into 9 geographical regions, with each region approximating the national borders of specific countries such the United States, Brazil, Australia, and Britain. Each region offers multiple availability zones. A n availability zone is simply a single server farm that houses multiple data centers. Generally, each availability zone is isolated from its neighbors so that a power outage affecting one zone does not affect other zones. The simple answer to this is the fact AWS has proven to be the most popular cloud computing solution to both businesses and consumers. There are 5 main advantages; scalability, agility, flexibility, security, and high cost-benefit ratio. To begin with, AWS is highly scalable and modifiable. This means that one can upscale any of its resources, for example, one can increase the storage capacity, CPU power, and even bandwidth simply by adding more resources from the AWS portal. Apart from this flexible capacity, AWS also offers instant elasticity as one can set the maximum infrastructure capacity at a very high value so that when data traffic is high, the infrastructure is not overwhelmed. The other key advantage is low ongoing cost as AWS uses a pay-as-you-go pricing model which requires no up-front payment nor does it require one to make any long-term commitments. Therefore, if one does not need the AWS system, one is not charged for it. Also, the centralized billing and resource management offered by AWS allows one to know how the charges have been broken down across the resources used. Another advantage of AWS is its speed and agility as it allows one to develop and deploy any app/software quickly as there is no need for one to look for dedicated hardware or setting up such hardware. Also, AWS allows one to focus on relevant projects as operations and investments related to data center setup and management are taken up by Amazon.com. Moreover, AWS has a global reach which allows one to select a data center that is nearest to the target audience. Likewise, it allows one to offer their apps to a global audience in seconds. Another additional advantage of AWS is that its programming model and development platform is open and flexible. What is more? AWS offers a secured cloud infrastructure which uses multiple security layers to protect data contained in its data centers. Still, there are 4 main problems associated with AWS, and all of them can be solved by a well-trained AWS professional. The first problem is lock-in as Amazon.com releases more proprietary services/apps, and then makes these services and apps only compatible with the AWS infrastructure. This means that these AWS apps/services cannot be used in non-AWS infrastructure which can cause problem in hybrid cloud system. Therefore, the Amazon apps used in AWS are locked in AWS and cannot be used in other IaaS cloud infrastructure. Still, AWS allows one to use non-Amazon proprietary software, such as Microsoft Office Online, with AWS so long as transfers the licenses of these softwares to AWS using the BYOL (Bring Your Own License) module of AWS. Secondly, the learning curve of AWS has a slow study gradient as one needs to master skills in order to use AWS optimally. Thirdly, one needs to build the correct infrastructure or else the AWS will not work well, sometimes cannot even run at all. Lastly, the cost of the different AWS resources does add up, and if one chooses redundant services, then the operation cost can rise steeply. To solve, manage, or avoid these aforementioned problems, one needs to be trained on how to use AWS. And that’s where you come in. With job opportunities aplenty, there is no better time to become AWS certified. Taking one of the above courses will get you that one step closer to realizing your career goals in this relatively new and exciting technical field.